What do the occult, James Joyce, the apparent vagaries of the quantum world and a giant white rabbit named ‘Harvey’ have in common? They have all been central concerns of one of the most dynamic and insightful humans who ever set pen to paper, a man who effectively helped to build the intellectual foundations of late 20th century counter-culture and whose wit and insight have inspired the lives of countless truth-seekers the world over. 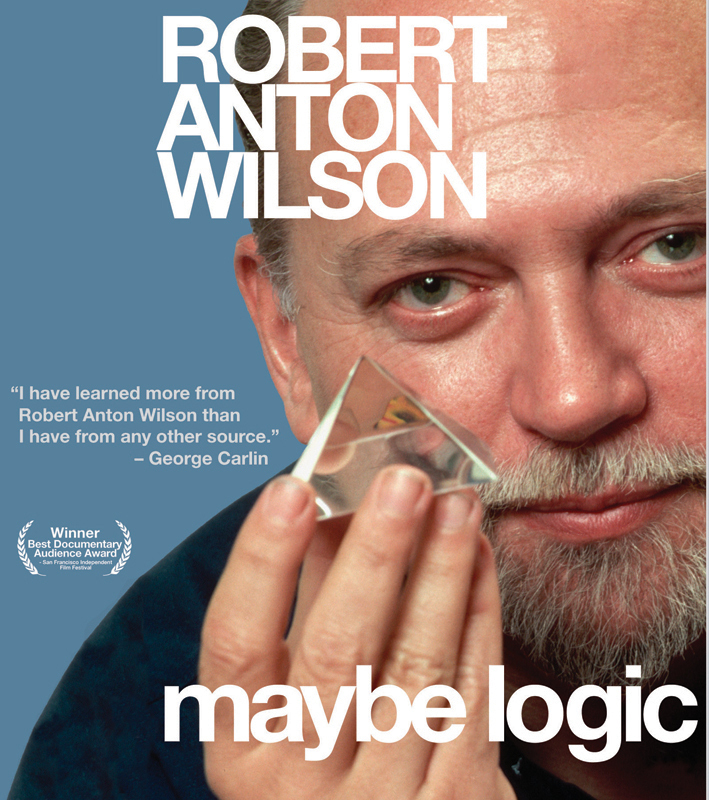 Robert Anton Wilson, renowned futurist, author and ‘guerrilla ontologist’, is the subject of Maybe Logic, a lovingly crafted celluloid tribute to the man and his ideas. This DVD from Deepleaf Productions differs from many documentaries in that it doesn’t follow the typical ‘childhood-school-hardship-success’ pattern of typical biographies, and is all the richer for it. Instead, it opts to present the viewer with a melange of contemporary and archival interview footage, laced with appropriately expansive visuals and a wonderful soundtrack from artists such as Funki Porcini, The Boards of Canada and The Supplicants (to name but a few). What this approach does is allow the philosophical underpinnings of Wilson’s work to emerge as naturally as the sun over mountains at sunrise, without the overbearing presence of a narrative voice directing the viewer’s attention along an arbitrary track – a decision that, on reflection, also seems a silent nod to the multivalency of Wilson’s thinking. Lance Bauscher and the team at Deepleaf are to be applauded for their meticulous editing, having whittled hundreds of hours of raw material into a tight and compelling 90 minutes, and while much of the material featured in Maybe Logic will be familiar to long-time readers of Wilson, to hear these ideas expounded by the man himself is a delight. His croaky Brooklyn lilt belies the heft of his message – that the Universe as we experience ‘it’ is a non-simultaneously apprehended process, as open to our manipulations as we are to its own. At its core is an unfailing conviction in the limitless potential of the human organism to achieve the heavens we long for – or the hells we dread. At turns fiery, at others the epitome of Zen sagacity, we see Wilson in the grip of post-polio syndrome, the ravaging effects of which have left him effectively confined to a wheelchair – and yet his optimism is unfailing and his light is not dimmed as he rails against an establishment determined to deny access to the pain-relieving effects of medicinal marijuana, the only analgesic he has found to minimise his suffering. As the film unfolds it is deeply touching to see how, in the space of a few short years, his formerly robust presence has been leached away to leave a man barely able to stand; and how, despite this, his eye still sparkles as though he did indeed hold ‘the final secret of the Illuminati’. Besides the feature, there are over three hours of bonus material including extended interviews from the likes of Reverend Ivan Stang (of the Church of the Subgenius) and R.U. Sirius, randomised montages, and Maybe Logic exercises to break beyond your own inner boundaries – but if all that still isn’t enough to grab you, the analogy that Wilson gives pertaining to the workings of quantum physics is worth the price of admission alone. There are a couple of things that would have served to round out this film; his wife Arlen deserved more screen time, and a deeper biographical account of his writing would have been fascinating. Despite this, however, Robert Anton Wilson presents an intoxicating blend of shamanism, psychedelic adventurism and sheer Irish pluck, the man’s singular status confirmed in the veracity of his introduction by the Reverend Stang at a recent Subgenius ‘devival’ – ladies and gentlemen, I give you ‘the Robert Anton Wilson of humanity’. NB.Immediately after posting this review, I discovered via the internet that Wilson passed away on the 11th of January, 2007. I am saddened somewhat by this, given the deep (and liberating) impression he made on my own thinking, and hope that any who have the opportunity to do so will read his books and themselves get a taste for the unique contributions he has made to literature and philosophy. He spoke truth to power, smiling the whole time – RIP, RAW.